Armed Republic Makasta is a nation led by High Grand General Hoszt Enstin on the continent of Asia. 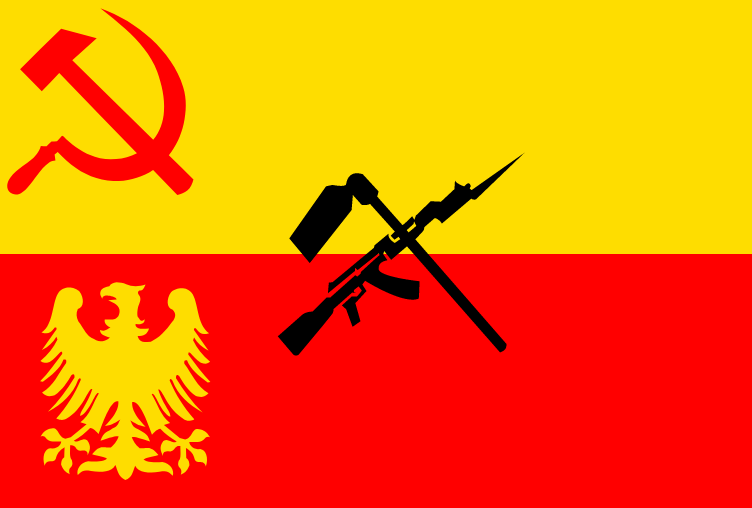 Armed Republic Makasta's government is a Communist Dictatorship with very authoritarian social policies. Economically, Armed Republic Makasta favors far right wing policies. The official currency of Armed Republic Makasta is the Orbis Note. At 300 days old, Armed Republic Makasta is an old nation. Armed Republic Makasta has a population of 992,582 and a land area of 8,000.00 sq. miles. This gives it a national average population density of 124.07. Pollution in the nation is a disaster. The citizens' faith in the government is completely depleted with an approval rating of 0%. 04/18 02:05 pm - Makasta had war declared by Discord for the reason of "We have come to liberate you". 04/17 11:10 pm - Makasta had war declared by Tampa bay for the reason of "$$$$$$$$$$$$$$$$". 04/17 04:53 pm - Makasta had war declared by Aesiir for the reason of "You're a disease, and I'm the cure.". 04/15 01:48 pm - Krampus removed Makasta from the alliance SPQR. 04/13 12:33 am - Makasta applied to join the alliance SPQR. 04/12 12:54 pm - The embargo on Makasta placed by Kaslandia has ended. 04/12 10:25 am - Makasta was embargoed by Kaslandia. 04/11 12:07 pm - Makasta had war declared by Westerosi for the reason of "$3M for peace". 04/11 11:22 am - Makasta had war declared by Bharat desam for the reason of "dm for peace". 04/11 06:38 am - Forethought removed Hoszt Enstin from the alliance The Chaos Insurgency. 04/11 12:15 am - Makasta had war declared by Gad kingdom for the reason of "We don't like you". 03/12 12:39 am - Makasta declared war on Edwardia for the reason of "You brought this on yourself". 03/09 01:37 am - Makasta declared war on Pouthena for the reason of "This, is, SPARTA!". 03/08 03:13 pm - Makasta had war declared by Orptian for the reason of "Long live the King". 03/07 01:59 am - Makasta changed their Color Trade Bloc from Blue to Maroon. 03/02 01:48 am - Makasta changed their Color Trade Bloc from Gray to Blue. 02/21 01:40 am - Makasta applied to join the alliance The Chaos Insurgency. 02/21 01:39 am - Makasta left the alliance United Nations. 02/18 06:28 am - Makasta had war declared by ImperiaIism for the reason of "Gib me all ur moneyz". 02/18 01:44 am - Makasta changed their Color Trade Bloc from Gray to Blue. 02/12 09:18 pm - Makasta had war declared by West Point for the reason of "You're a disease, and I'm the cure.". 02/07 01:39 am - Makasta changed their Color Trade Bloc from Gray to Blue. 02/06 04:33 pm - Makasta had war declared by United Provence of Europe for the reason of "Boo, I scare you.". 01/28 02:20 pm - Makasta had war declared by Shivdhaam for the reason of "Hasta la vista, baby!". 01/28 01:16 am - Makasta had war declared by Kiravoi for the reason of "Arrgh!". 01/24 08:58 am - Makasta had war declared by Kingdom of two knights for the reason of "Do you feel lucky, punk?". 01/24 12:21 am - Makasta had war declared by DarkEvil666 for the reason of "Welcome to Orbis. ".